I am seeing squares! I feel like I have spent the whole week charting. The yurt band design that I charted and wove into a cell phone pouch last week was pretty easy to pick out from a photograph. So I launched myself into a bigger yurt band design this week. A lot of the elements are similar so I figured it would be a piece of cake but, as it turns out – not so much. Getting the main motif down was easy but filling in all the background floats was the hard part. Where exactly to place the five-span floats around the curves in the motif was the dilemma and the photo I was working with was no help at all. I really wish I could put the photo here but it is not mine to show. The original band has the main motif in orange on a slatey blue – it is gorgeous – but I have stuck with some old faithful colors for this first attempt. The outer bands have a brown motif on beige and the main section beige on red. Anyway, I think I have finally got it down. I do have a drawing program for this kind of thing but I prefer the old fashioned way – sprawled on the floor with marker pens, corrector, pencil, eraser and scotch tape. 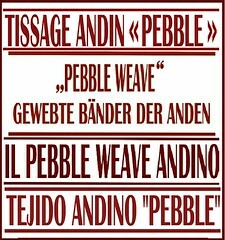 Thank goodness someone came up with the simple name “pebble” to describe my favorite pick-up weave as the description for that is even longer. I have been trying to find the origin of the name “pebble” but haven’t had luck with that. It is a name that seems to be applied quite loosely to a variety of weaves and I am wondering who first coined it and to which structure in particular they were referring. Imagine my surprise when a young weaver in the main plaza in Cusco used the term “pebble weave” to describe the band she was trying to sell. But, back to my “warp floats galore”. 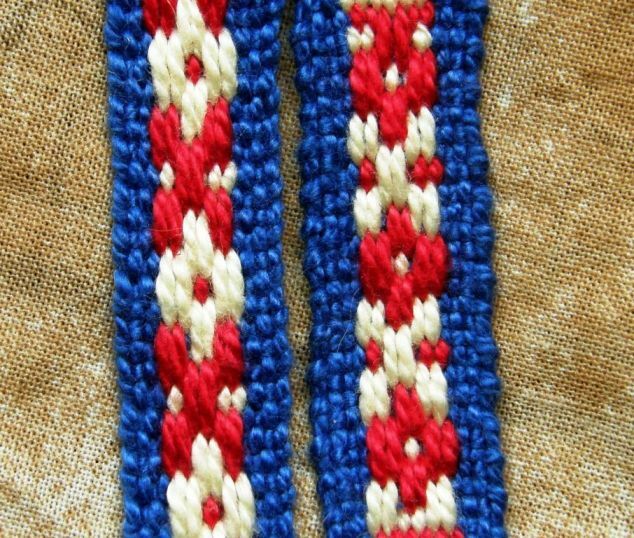 I also charted the border design of Lisa’s yurt band so that I could do a tutorial based on that here this week and, fortunately, I can show you a photo of that, thanks to Lisa. I wove it in a variety of yarns and color combinations to see which I liked best. 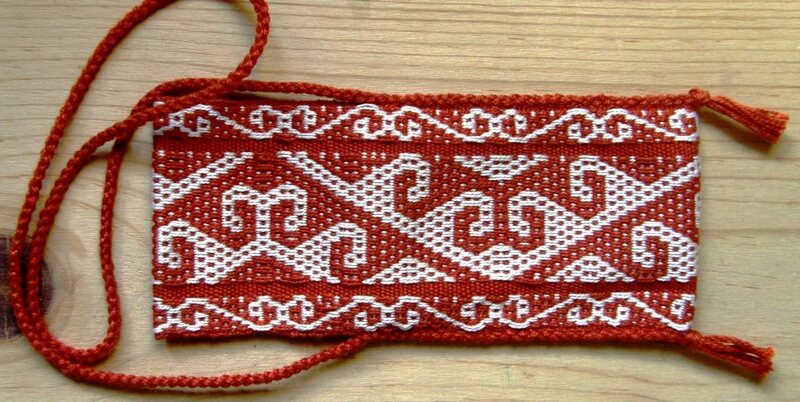 The example on the yurt band uses three colors one of which is also used as a border. 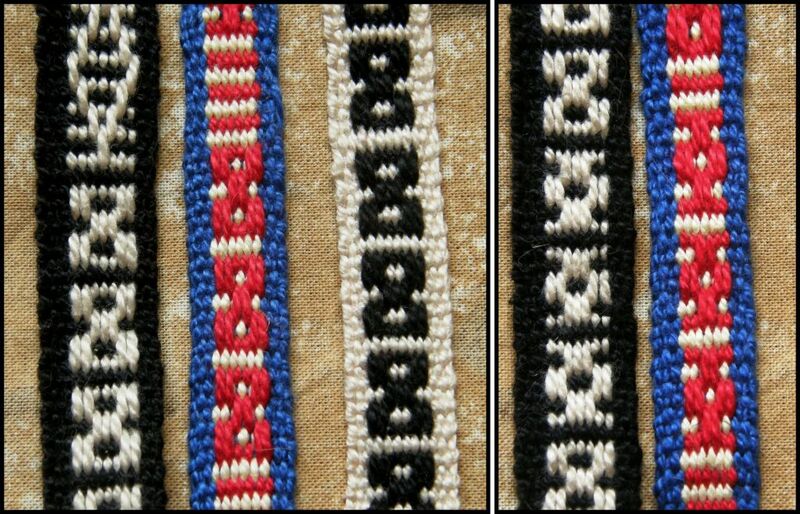 Four versions of the yurt band border design. The one on the right is the most authentic as I used the same color to weave the O's and the borders. and made another cell phone pouch. I have to tell you that I don’t even own a cell phone but I think these make great gifts. 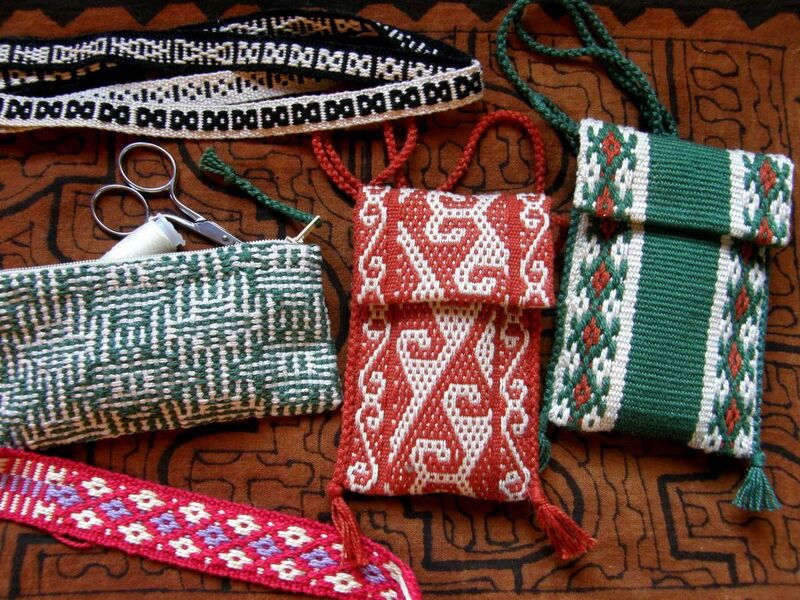 I usually take woven coin purses along on my travels as gifts for my indigenous weaving teachers. On a trip to Ecuador I was looking for a typical spindle whorl and asked a group of ladies who were embroidering skirts in the marketplace . No one showed much interest or enthusiasm for my request. I then offered one of my little coin purses to anyone who could get me a whorl. In the blink of an eye out came all the cell phones from deep inside the folds of their blouses! So I think that these little pouches may be appreciated and may make better gifts than the coin purses from now on. The border design from the yurt band comprises a series of what I call X’s and O’s. These are about the most basic designs you can weave in this simple float technique. 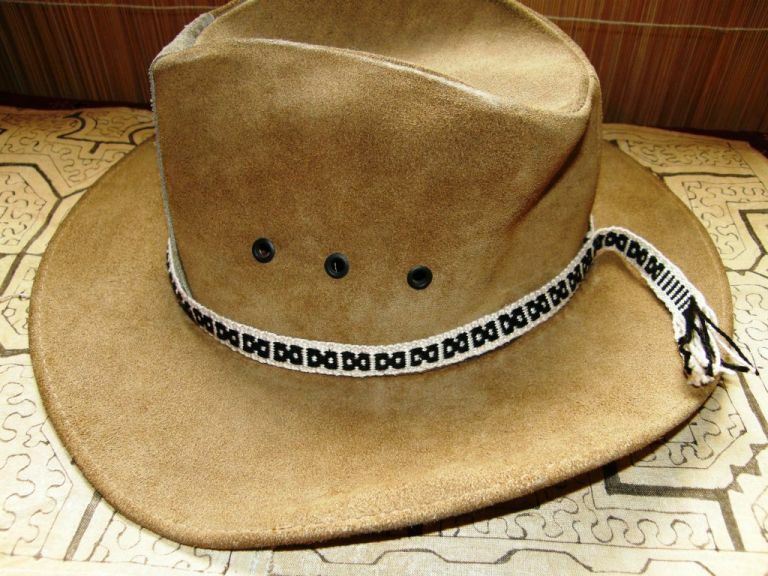 I used a series of X’s separated by a single stripe to make the hat band at left. Starting off with black and white horizontal stripes, the black warps float over the surface to form the X motifs. In the above examples, the X’s and O’s are separated by a single stripe. If you put the X’s and O’s together on the one band and weave them in succession so that they overlap, they will look like what you see at left. The example on the left has red X’s and yellow O’s. This is reversed in the example on the right. Now it is just a matter of putting three columns of X’s and O’s together and, voila! you have the yurt band border. 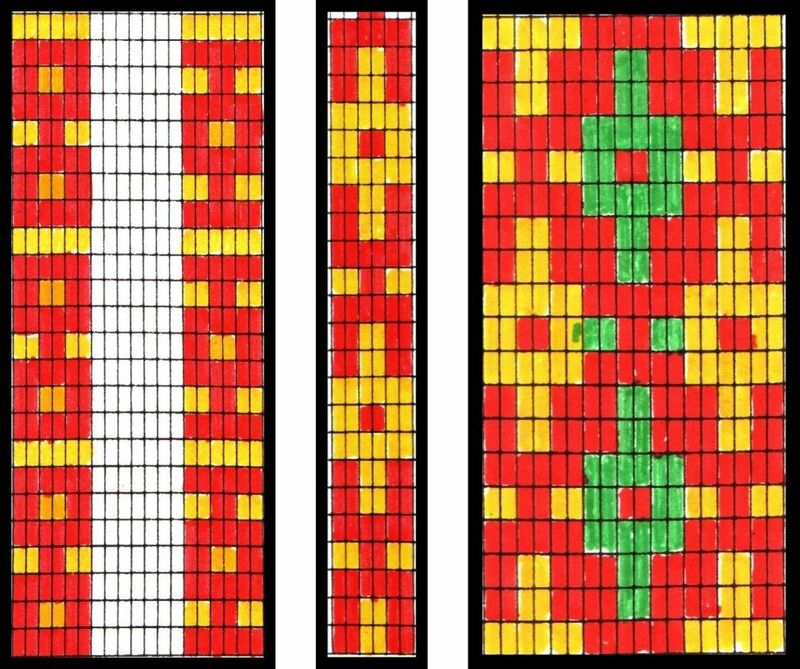 LEFT: X and O motifs; CENTER: X and O motifs overlapped in succesion; RIGHT: Three columns of X's and O's - the yurt band border. 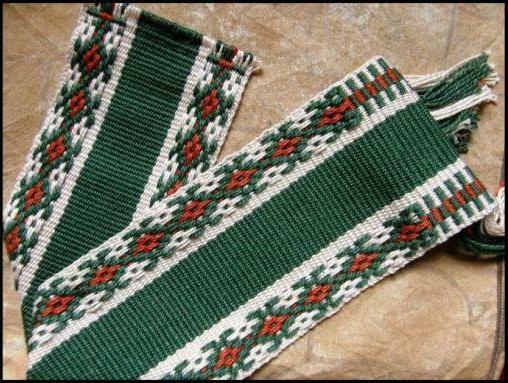 I am going to give a step-by-step tutorial here now for the yurt band border. For those of you who have never woven this simple warp float technique, there are step-by-step instructions here. 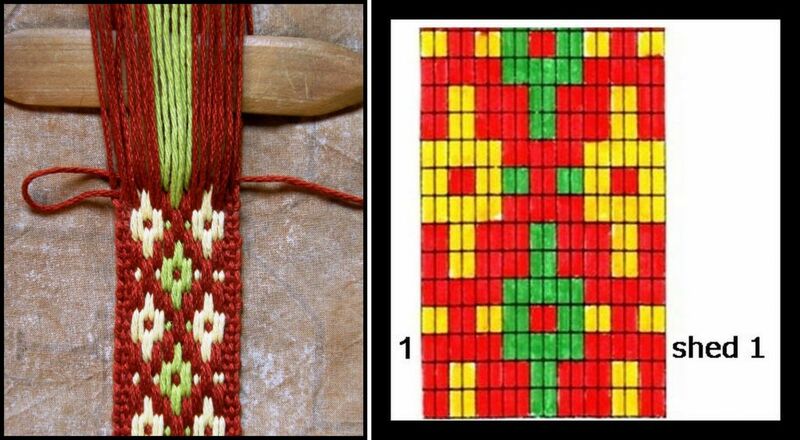 The tutorial there guides you through warping, arranging the cross and weaving some simple patterns. Once you have the hang of weaving this border design, especially the parts where the two motifs overlap, you will have the skills necessary to weave the yurt band design that I wove on the cell phone pouch last week – at left. But, I recommend starting small! Practice the small design in this tutorial and make something useful. 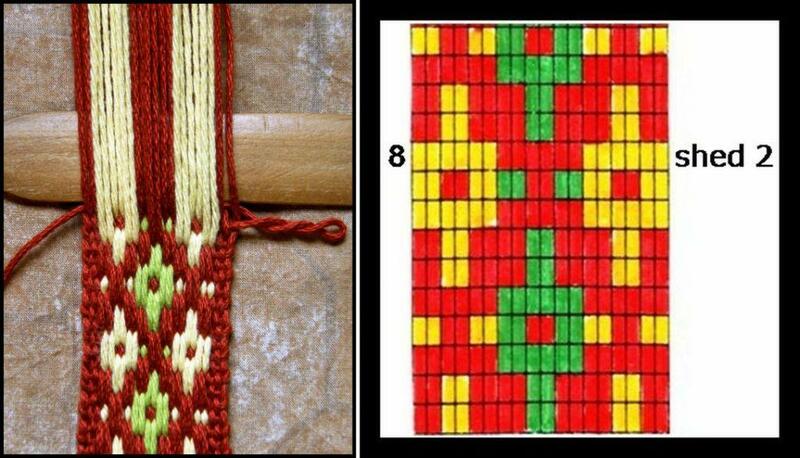 Next week I will give the chart and instructions for weaving the border of the red cell pouch, pictured below. This is a warp-faced weave. 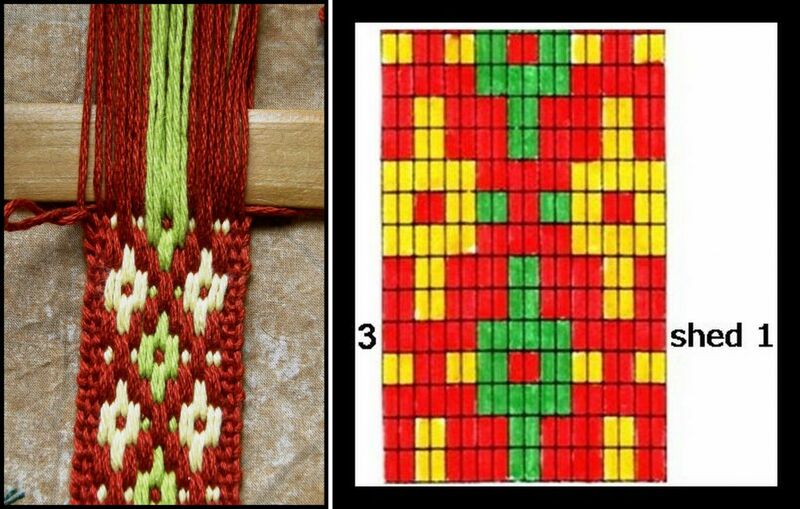 You need to wind a warp and rearrange the cross so that it looks like the picture at left. The warps in shed 1 will go in heddles and shed 2 will be controlled by a shed stick. I have 4 ends in each of my borders. I am working with 18 warps, or 9 pairs of warps in each shed. 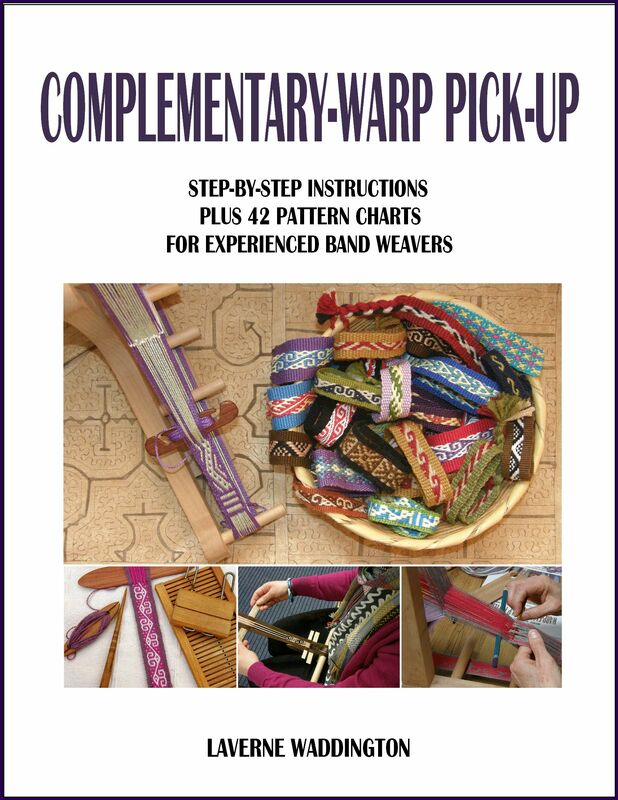 This tutorial gives instructions for weaving the first 10 weft passes. Start by simply passing the weft through sheds 1 and 2 and weaving a few rows of horizontal stripes. I recommend passing your weft from left to right in shed 1 to be in sync with these insructions. FIRST WEFT PASS: Start the design by passing your weft through shed 1. My weft is passing here from left to right through shed 1. SECOND WEFT PASS: Select the warps from shed 1 that will float. These are indicated on the chart as pairs numbered 2, 4, 6 and 8. Add these to all the warps in shed 2. Pass the weft from right to left. THIRD WEFT PASS: Pass the weft from left to right through shed 1. FOURTH WEFT PASS: Select the warps from shed 1 that will float and add them to all the warps in shed 2. Pass the weft through this shed from right to left. This is where the designs overlap so we need to float warps again for this weft pass and will be selecting them this time from shed 2. FIFTH WEFT PASS: Select the warps from SHED 2 that will float and add them to all the warps in shed 1. Pass the weft from left to right. SIXTH WEFT PASS: Pass the weft from right to left through shed 2. SEVENTH WEFT PASS: Select the warps from shed 2 that will float and add them all to the warps in shed 1. Pass the weft through this shed from left to right. EIGHTH WEFT PASS: Pass the weft from right to left through shed 2. 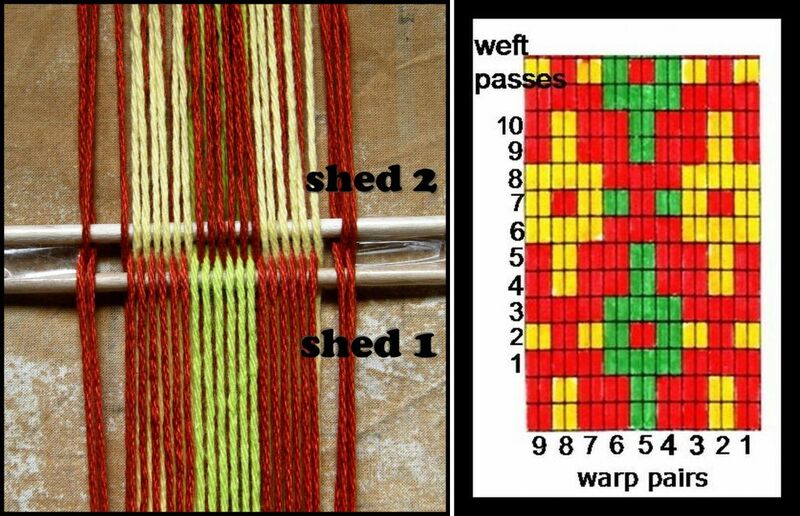 NINTH WEFT PASS: Select the warps from shed 2 that will float and add them to all the warps in shed 1. Pass the weft through this shed from left to right. This is where, once again, the motifs overlap so we need to select warps to float again but this time from shed 1. TENTH WEFT PASS: Select the warps that will float from shed 1 and add them to all the warps in shed 2. Pass the weft from right to left through this shed. And there it finishes. We are back to step 1 – the first weft pass. The yurt band designs on my red cell phone pouch reqiure that you select warps to float for every single weft pass. 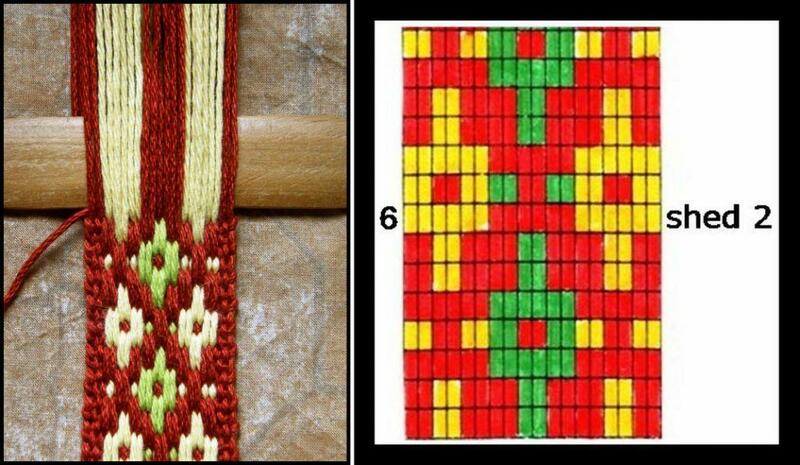 Some project ideas for using this technique and design: weave four or five columns of X's and O's together and make a bookmark; weave the design next to plain weave and make a cell phone pouch, coin purse or sewing kit purse. Even the smallest sample can be made into something useful. I sewed a zip into the little shadow weave sample I showed you last week and made a sewing kit purse. 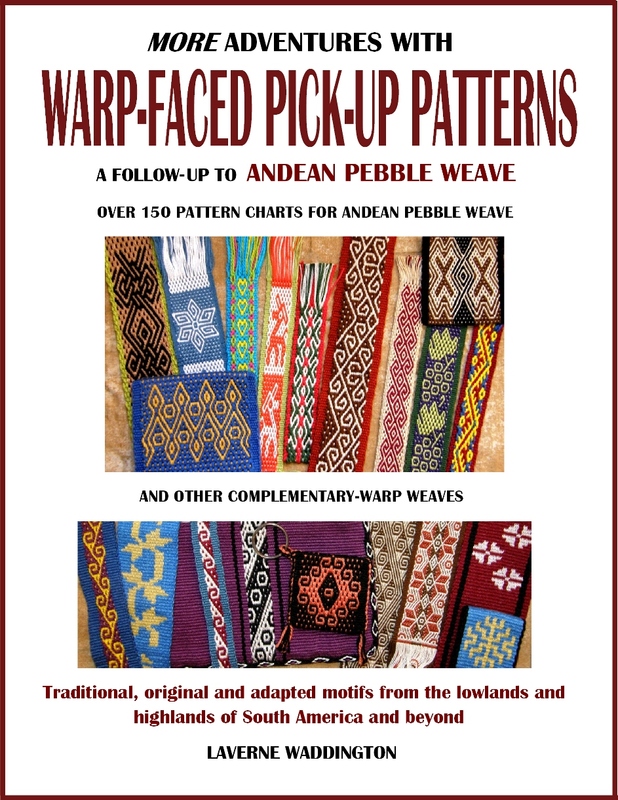 I thought I would finish this post by revisiting coastal Ecuador and the weavers there who taught me this simple warp float technique in the first place. 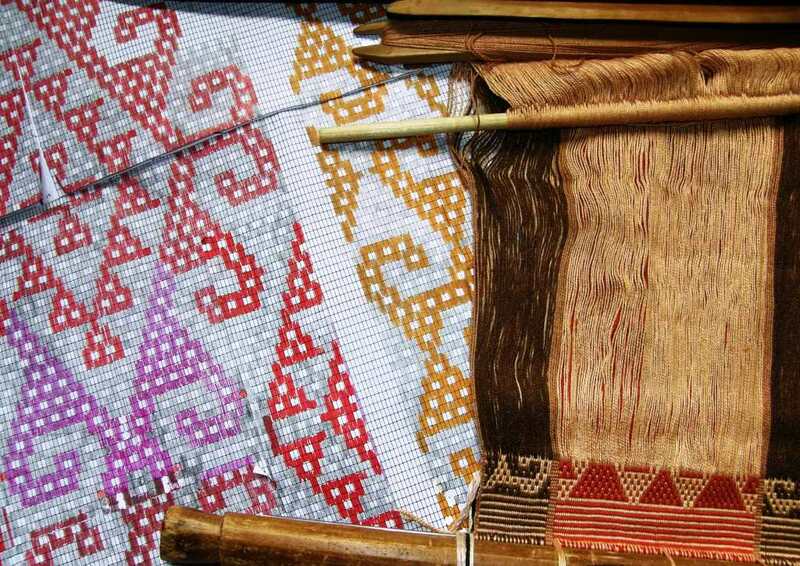 I showed you all a little about their weaving here in another post so this time I will show a bit about their spinning. The weavers I stayed with are amongst the few in the area that still weave with their own homespun cotton. 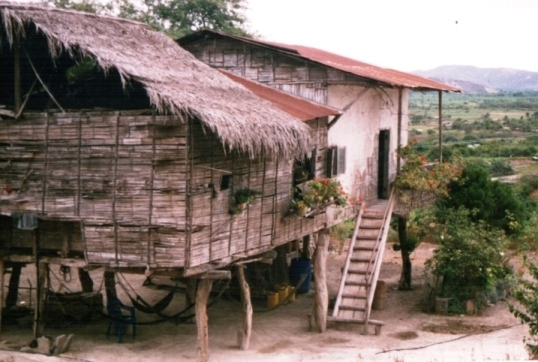 Although there are still a few wild cotton plants scattered about the settlement where these weavers live, they usually have to buy their cotton in the market. It needs to be deseeded, teased and beaten into a smooth even sheet before it can be spun. 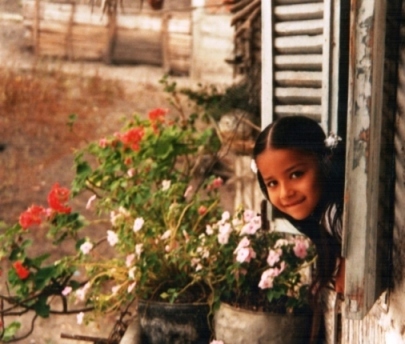 While natural brown cotton is highy prized and expensive in Guatemala, it doesn’t seem to be considered anything special in Ecuador. The cotton is draped on a wooden stand called the "rueca" for spinning. The "rueca" has a notch cut into its top which grabs the cotton and allows the spinner to draw out the fibers under tension. 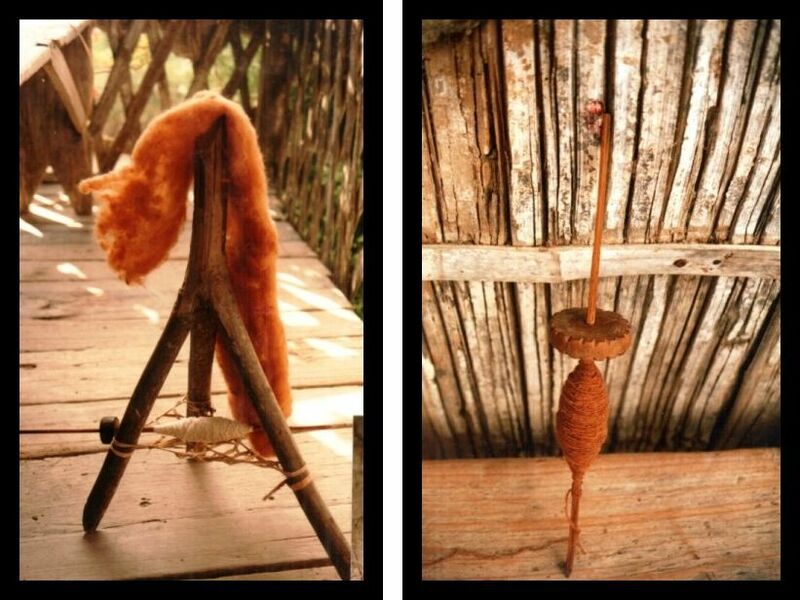 A small basket is woven from plantain fiber underneath on which the spindle sits when not in use. This is a miniature version of the "rueca' which I made with my teachers' help so that I could take an example back with me to Bolivia. The typical spindle can be seen at right with its wooden whorl. More often now you will see people using yo-yo halves and metal wheels as whorls. 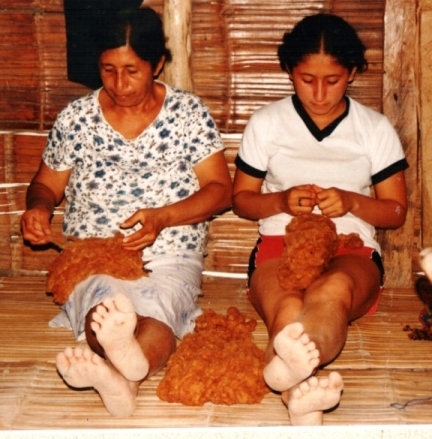 Here my teachers are spinning with their large ruecas-one hand twirling like mad while the other draws out the fibers. I am having a go. I found this a lot harder than spinning with a drop spindle. I taught Trini to spin with my drop spindle and she picked it up in seconds. The people in these settlements are basically farmers - up at 5am with the roosters and the donkeys to go out and work the fields so they can be indoors during the hottest part of the day. Then off to bed at 9pm. Here are some bead spindle whorls that they have unearthed while digging and turning the soil for planting. Mind blowing!! 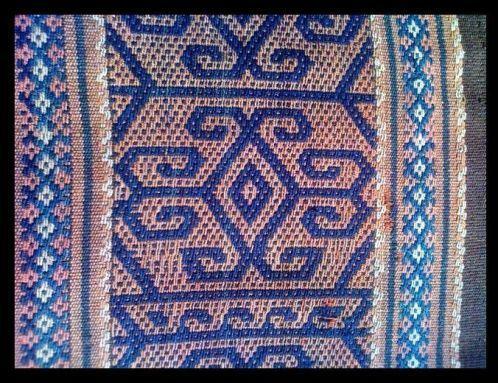 Some simple warp float designs from coastal Ecuador that I wove and have used as covers for my journal. And the spinning tradition lives on...the anthroplogist whom I accompanied on this trip has just gotten back from Ecuador and tells me that this little one is now up and spinning! « Backstrap Weaving-Simple Warp Floats: a little less simple, a lot more stunning! Thank you so much for sharing your knowledge, beautiful pictures, and wonderful stories, Laverne! Your cell phone case in the picture above looks like it has a four-strand braid along the joining edges. Is this used as a joining technique, or is it applied after sewing the edges? I have an old inkle weaving video (Supplementary Warp Patterning with Jacquetta Nisbet) in which the author talks about a woven joining technique. Unfortunately, she never demonstrates it. Is this joining technique something you’ve run across? Thank you, again, for your gifts to the community! The 4-strand braid on my cell phone case is simply braided and sewn on after.. I did learn to make a tubular woven band in Potosi which is woven and sewn to join the two sides of a piece simultaneously. The weft for the tubular band acts also as the sewing thread. 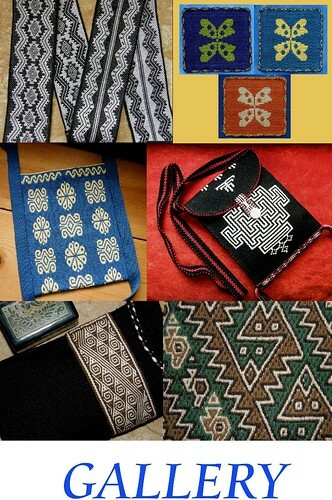 In Ecuador, the weavers I worked with who are featured in this post also weave a simple flat band which they sew to the edges of their saddlebags using the weft. I plan to show the tubular band in a future post…stay tuned! I am pleased that you are finding useful things here. Beautiful, informative, well-thought out article, Laverne! I enjoyed it so much, thank you! Hola, acabo de descubrir su blog, lo único malo que encuentro es que esté en inglés… no lo entiendo, bu!! Le escribo desde Perú, me gusta tejer y estoy debutando en los telares, hace poco una amiga colombiana me mostró cómo usar el telar egipcio o de tarjetas, tienes conocimientos de él??? yo sé lo básico, pero ando buscando más, al igual de otros telares de cintura, espero puedas publicar información en castellano, o si me puedes pasar el dato de algún blog que lo tenga… te invito a visitar el mío (http://demismanos-uchu.blogspot.com/). I am sorry about repeating my question since i have never tried emailing you before I am not sure you received it. How do you braid the palma and or the marguerite braid? 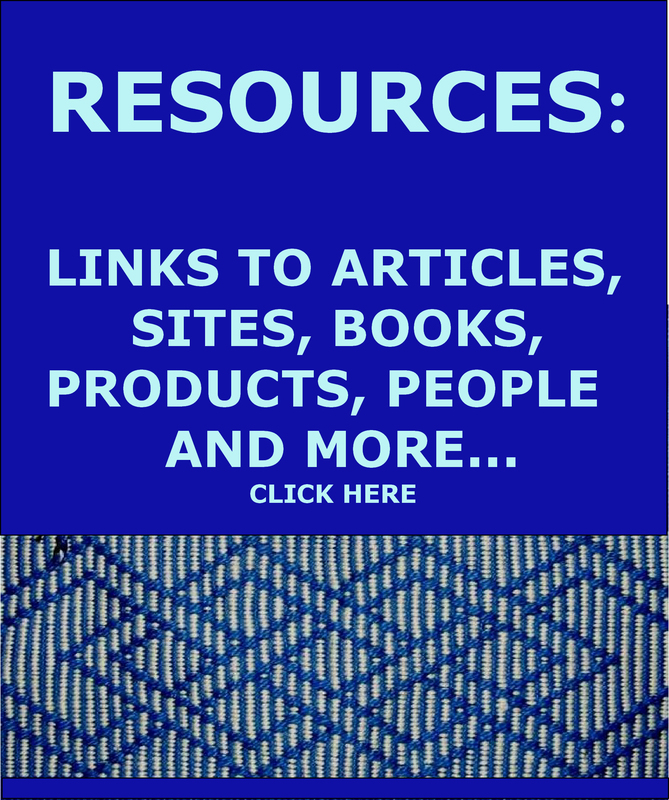 I think you have a wonderful site and you do a good job of explaing things.We have owned llamas for over 12 yrs and I use their fiber it would be another way to use my fiber.Or if you know of a book that could expain how to braid that would be fine too. thankyou susan r.
Read through the comments here. I replied to your original question. Thank you for that very informative and exciting post. I have recently returned from a trip to the farthest of the North Eastern States of India – Arunachal Pradesh – and I was struck by how similar this technique is to one of the weaving techniques we came across there. The weavers of the Monpa tribe of Arunachal Pradesh weave intricately patterned satchels using a warp float technique that to me seems identical to the one you’ve demonstrated here. In fact, the similarity between the cultures of South America and the North Eastern region of India is quite phenomenal – it is the only part of India where backstrap weaving is practiced. Great to see your post – was just wondering whether it could really be coincidence that despite the huge geographical separation, there is this great commonality in material culture and craft. I have decided to take time out every week to visit some old corner of your blog to discover what ELSE you know that you might like to teach us the next time you are back in Vermont! Here I have fallen into a wonderfully simple tutorial that gives me the idea that our study group could (if willing) take on a challenge every month to learn (or at least be offered) something ‘new’ found on your blog that will inspire. We met yesterday for the first time since your visit, 5 out of 9 of us attending. Of those 5, 3 were people who had not taken the second weekend. Some hadn’t touched their warps since rolling them up after class. We spent an enjoyable 3 hours sorting out what was remembered and helping one another along. It will be interesting to see how many can make it next month. 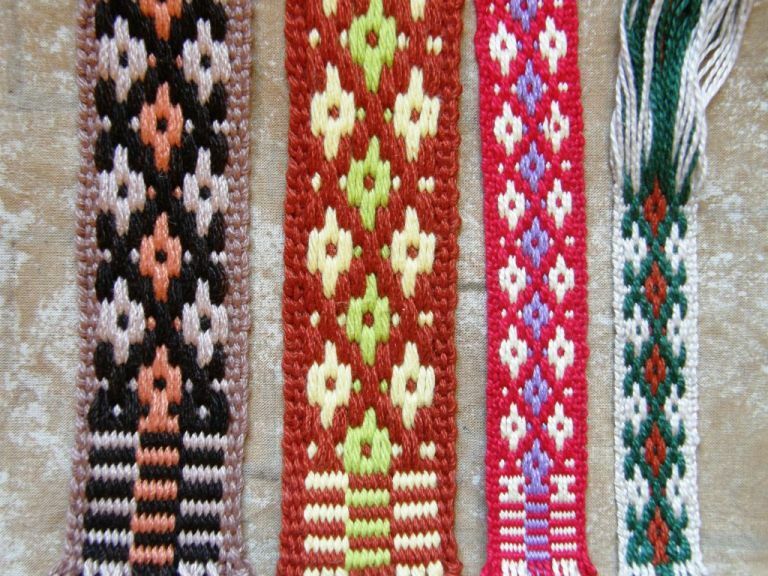 I envision a group that might be willing to take their inspiration to heart , letting the possibilities of backstrap weaving unfold in a wide range of expression. We shall see. Thank you for your educational and beautiful posts! I am currently learning basic warp floats and think I’m getting the hang of it. The front of the design looks like I’m on the right track, but on the back there are segments of weft showing up in the pattern-where I picked the opposite color. Is this the way the back should look or am I missing a step? Also, my weaving edges are always very orderly on the left size, and the right side are consistently uneven. I suspect that loose tension is the problem, as the right side is where I tie off the warp. Having great fun with this! Hi Kris. Yes, that is the way the back of the fabic is supposed to look. This technique creates warp floats only on the upper face of the fabric. The reverse has areas of exposed weft. 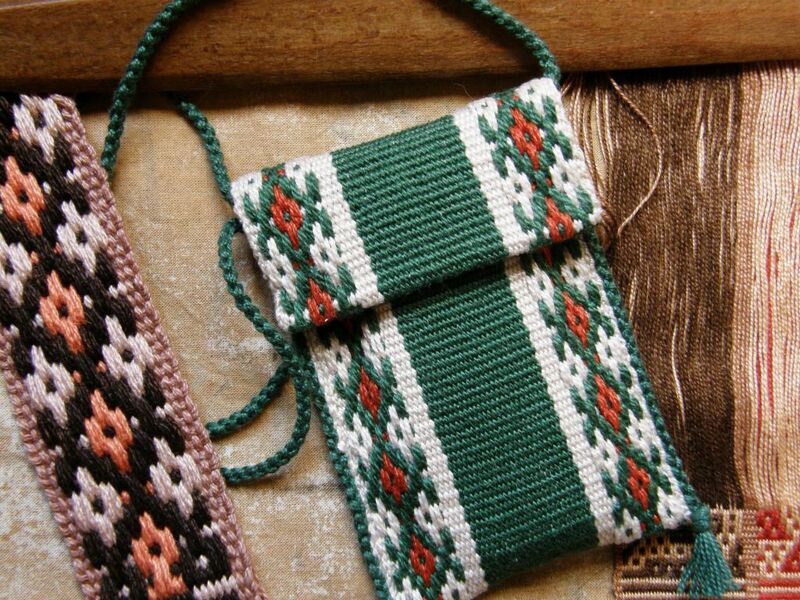 This is the technique used to weave the Central Asian yurt bands. If you find that your warp ends at the edge are loose on one side, you can always take up the slack by placing a neeedle, toothpick or something similar under them at the far end of the warp and securing it somehow to the back beam. Look closely at those edge warps. Do they look as if they are lying dead straight? They should be bending over and under the weft. The weft is the element that lies straight and the warps should bend over and under it. Sometimes if the weft is not being handled correctly at the edge, you end up with straight warps and it is the weft that is doing the bending instead. Naturally, if those warp threads are staying straight while all the others bend, they will end up longer and therefore looser than the others.